Serving exclusively Harris Ranch “Natural Beef”, Cattlemens ages and hand-cuts all beef selections on site. 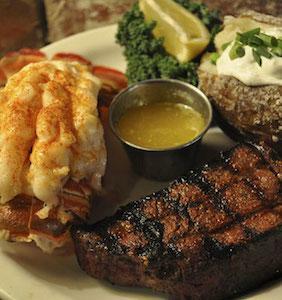 Signature steaks include the famous “Sizzling Prime Rib”, “King of Steaks” 32-oz. Porterhouse, New York Strip and Filet Mignon. Other popular items are Baby Back Pork Ribs, Grilled Salmon, Chicken and Pasta. All entrees are served up with all the fixin’s — All-You-Can-Eat tossed salad, hot sourdough bread and ranch-style beans. A popular spot for “More Beef for Your Buck” weeknight dinner specials and kid friendly dining. Seven days a week, Happy Hour is 4-6 pm in the saloon with savory small plates and thirst quenching hand-crafted cocktails served nightly. Full banquet and reception facilities are available for both day and evening events. Reservations accepted. Open at 4 p.m. seven days per week.